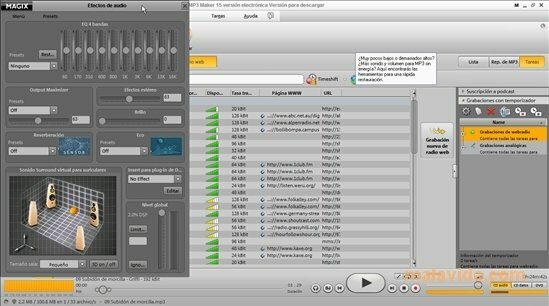 MP3 Maker is a music manager that will allow us to manage all our library cycle, from importing music from a CD, its conversion to MP3 to recording this music on any other device. It is one of the most complete music managers on the market, with options for practically all the aspects that have to do with importing, playing, managing and exporting music files. Thus, it can rename and tag music files by means of batch processing, create intelligent playlists with music recommendations that the program extracts from all the songs that form our library. It has a window with two virtual turntables that will allow us to create and record DJ sessions. We will also be able to edit several of the songs' aspects by means of the powerful sound editor that it integrates. MP3 Maker can record any song that is played on the Internet, including the audio of the videos found on sites like YouTube. 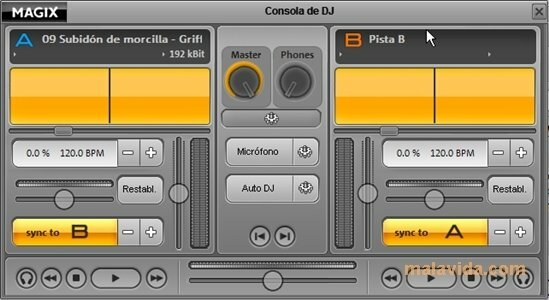 Likewise, it can play and record online radio, to do so that application includes a list of radio stations ordered by musical styles and general theme. It can analyze the full library to find and deleter those songs that are duplicated. It can also synchronize with all kinds of portable devices. As a player, it has an equalizer, other quality effects and an original Fraunhofer coder. It can also send music to a device enabled with UPnP via Wifi, so that it can be used as a web radio receiver. An ideal solution for music lovers that like to manage an extensive music collection through their PC.